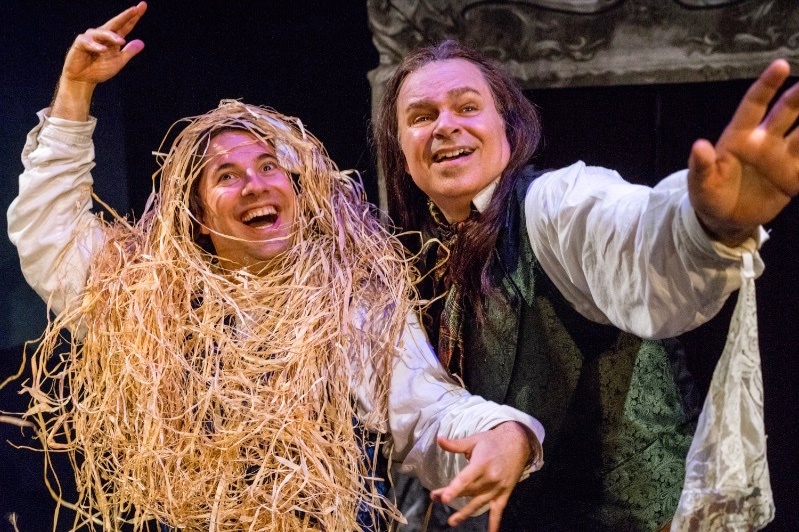 Carol's Theatre Reviews ~ It's Fun To Go Out: “Withering Heights”, Mr. Toads Wild Ride through Emily Brontë’s ‘love and love’s labor lost’. “Withering Heights”, Mr. Toads Wild Ride through Emily Brontë’s ‘love and love’s labor lost’. If you’ve ever been on ‘Mr. Toads Wild Ride’ at Disneyland you can imagine the trip founding father Phil Johnson of the newly minted Roustabouts Theatre Co. and his sidekick in arms Omri Schein are able to spin on Emily Brontë’s Gothic love story, and only novel (I might add)“Wuthering Heights”? Don’t ask! To believe what yours truly actually saw in this world premiere production (written by Johnson and Schein) that just recently opened at Diversionary Theatre is one that needs to be seen to be believed. And that’s no joke. Fear not though’, it is a wild and bumpy road; 120 minute tour de force that takes the audience through more doors/curtains than are required for any Disneyland ride. So sit back, fasten your seat belts and hang on! I will attempt to fill you in on some of the memorable details since much of the dialogue and shtick was lost in translation due to laughing out loud by so many of the audience in this relatively small venue. Not placing the blame anywhere, yours truly was as guilty as the rest. At times I found myself laughing into the next set of the Heathcliff - Catherine on again of again love affair. The gags and character changes come fast and furious. 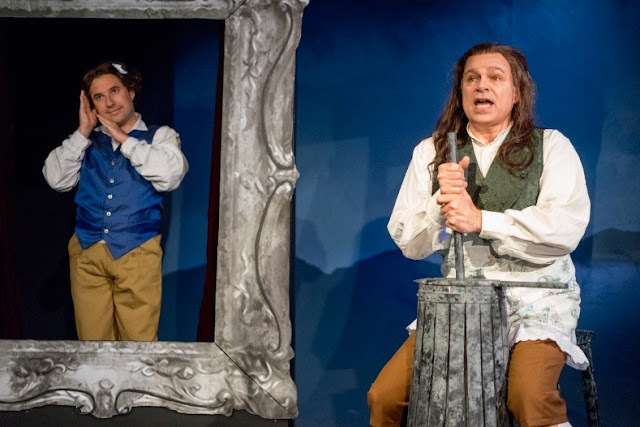 The two actors on stage (Phil taking on six characters and Omri, seven) simply go behind a curtained picture frame (Scott Amiotte) and came out as another character with a minimum or no costume change (Elsa Benzoni). Oft times they come through the picture frame with a slight change in tone or an affectation or inflection of any one of the 13 characters that is established from the start. Sound effects come are by Melanie Chen indicating a storm, horses approaching, location etc. Lighting by Curtis Mueller, wigs by Peter Herman and Bonnie Durban’s props help create the overall look, tone and period. Both wear the same wigs throughout. For Phil, a reddish longer than shoulder length bob, frame his smiling or frowning face depending on which character he is at the time. 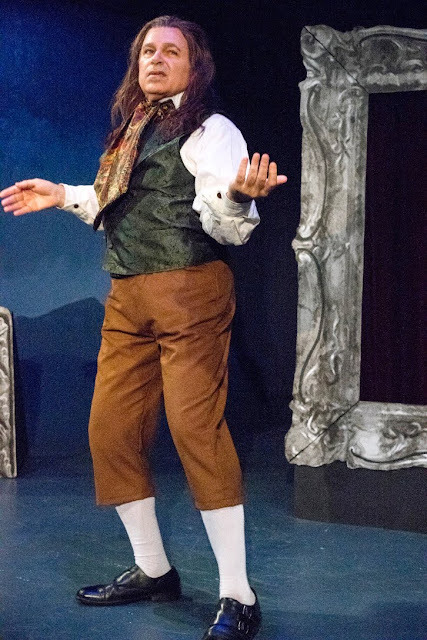 The schmata around his waist is used for an apron when he takes on the role of Nelly, the narrator/maid, or that same flowered cloth is draped over his head as a shawl when playing young Catherine or the older Catherine and as a fashion statement when he is Heathclif. 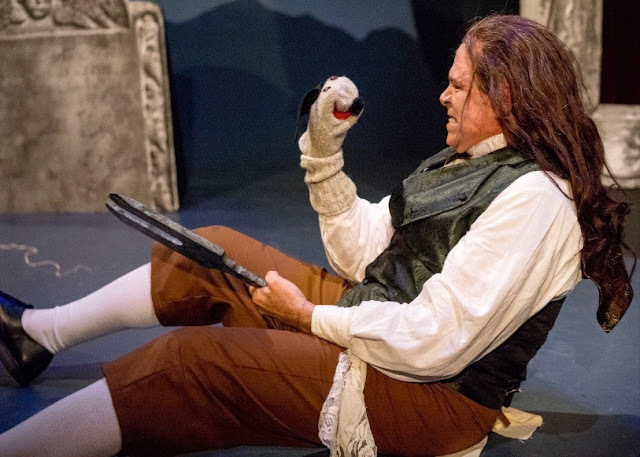 Phil as most of you know is the consummate funny man so when he put his sock dog puppet on his arm, barking and attacking whatever dogs bark at or he attacks Heathcliff, it’s side splitting craziness. And lest we forget the fart stuff, I guess that comes with the territory. 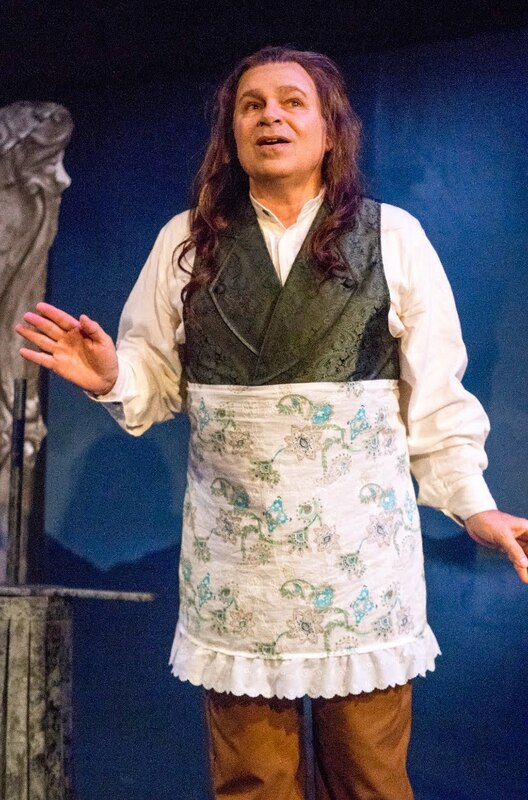 Omri has a few more subtle looks; a bow in his cropped black wig, a pair of glasses, a codpiece, well you get the picture. Omri is the perfect foil for Phil’s antics. Not to be outdone, Schein has a few or more tricks up sleeve as well. His thicker than fog accent and those crossed eyes take some practice. Lets not forget his manly struts especially when he comes out as Joseph, the pipe smoking servant barely understood or his feminine shuffles as Cathy Earnshaw, ‘a beautiful heroine’. The funny thing (and I say that in all earnestness) is that they follow Brontë’s tale through to the end. And I might add lovingly, like the story, it goes on a bit too long. David Ellenstein, artistic director of North Coast Repertory Theatre in Solana Beach, directed. What fun that must have been; I can only imagine. Suffice to say, both men are deliciously and decidedly coo coo. For some summer madness this one might just end up being the Pièce de Résistance. Ticket Prices: $38.00 + $4.50 ticket fee.